PORT CHARLOTTE - Jeff Smith has been named the sixth manager in Charlotte Stone Crabs history and will lead the 2019 coaching staff, the Tampa Bay Rays announced. The 2009 Florida State League manager of the year, Smith enters the Tampa Bay organization after spending 22 seasons in the Minnesota Twins system. Smith, 44, comes to Port Charlotte directly from the Major Leagues after wrapping up a two-year stint as the first base coach for Minnesota. He was also responsible for baserunning and catching instruction. Prior to his two years in the Bigs, Smith spent 11 years as a minor league manager, recording an impressive 457-366 (.555) mark in the Florida State League. "With the Florida State League, I get to do all the things I love to do," Smith told the Scrum Sports. "I get to manage baseball, I get to teach baseball and my family gets to see me a lot more while I'm doing it. I got the same feeling from the Rays as having that same type of family and the same kind of commitment. You could feel that they are committed to their people and committed to their staff." The Akron, Ohio native made his coaching debut in 2005 as the hitting coach for the Gulf Coast League Twins and was quickly promoted to Manager of Low-A Beloit. Over two seasons, he led the Snappers to a 151-125 (.547) record and a pair of postseason berths. Smith was promoted to High-A Fort Myers in 2008 and had remarkable success in the Florida State League. He led the Miracle to back-to-back postseasons, earning a combined record of 157-117 (.573). After winning the South Division title in both halves of 2009, Smith's Miracle fell to the Charlotte Stone Crabs in the 2009 South Division Series. Smith spent the next five seasons (2010-14) as the skipper for the New Britain Rock Cats, the Twins' Double-A affiliate. He returned to Fort Myers for two seasons (2015-16) before earning the opportunity at the Major League level. "One of my strengths has always been teaching, but I think another one of my strengths that has grown over time has been being able to take the analytical side and using it wisely and using it as another tool to teach," Smith said. "I've learned to take that information and make it simple for the players and make those players better rather just using it in game situations." A former 20th Round pick by Minnesota in 1995, Smith played nine years in the minors, spending parts of six seasons at the Triple-A level. A graduate of Naples High School, Smith spent the next three seasons in DeLand, batting .306 for Stetson University while drawing more walks (71) than strikeouts (68). 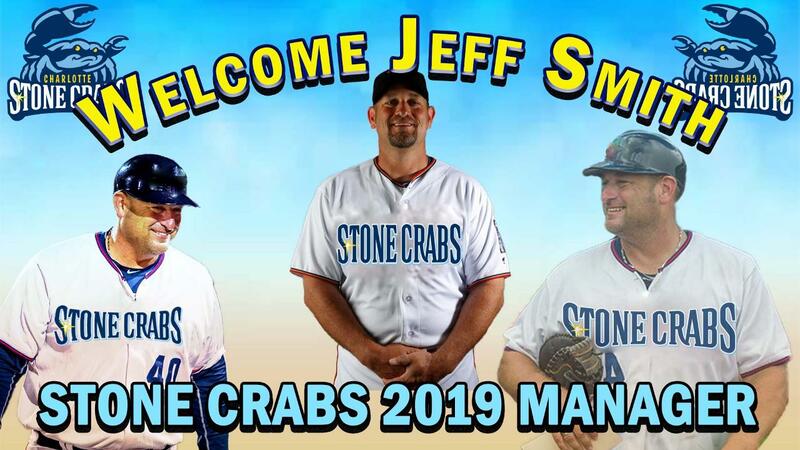 Smith will lead a staff that includes two Stone Crabs veterans in pitching coach Steve 'Doc' Watson and coach Joe Szekely. Former major league infielder Ivan Ochoa rounds out the clubs' 2019 coaching staff. Watson returns to the Stone Crabs for his sixth consecutive seasons as pitching coach and eighth overall. He led the best pitching staff in Charlotte history in 2015, a group that set franchise records in ERA (2.87), shutouts (17) and fewest hits allowed (1,033). The Bradenton, Fla. native has tutored 17 former Stone Crabs who have reached the Major Leagues, including Cy Young Award winner Blake Snell. Prior to his time with Tampa Bay, 'Doc' spent 12 years with the Pittsburgh Pirates, five with the Baltimore Orioles and three with the Miami Marlins, serving as pitching coordinator, rehab coordinator and pitching coach. Szekely enters his tenth season in Port Charlotte, having overseen the Stone Crabs' hitters in all but one season of their existence. Prior to his time as a hitting coach, Szekely managed the Devil Rays' Advanced-A affiliates in both Visalia (2006) and Vero Beach (2007), before going to Princeton in 2008. He broke in with Tampa Bay in 2005 as the skipper of the Low-A Southwest Michigan Devil Rays. The Texas A&M product also spent six years with the Kansas City Royals and three with the Atlanta Braves. He played 10 years in the minors, four of which came at the Triple-A level. Ochoa joins the Stone Crabs' staff for the first time. A former Major League infielder with the San Francisco Giants in 2008, Ochoa spent the 2017 and 2018 seasons as a hitting coach for the Dominican Summer League Rays. A native of Guacara, Venezuela, Ochoa played 11 seasons of professional baseball for the Cleveland Indians (six years), San Francisco Giants (two years), Boston Red Sox (one year) and Los Angeles Dodgers (one year). James Ramsdell returns to Port Charlotte for his second year as the Stone Crabs' athletic trainer and seventh in the Rays' organization. Sergio West will serve as the team's conditioning coach.